Besides my monthly hormonal breakout *physically and mentally (#adulting), the one way I can tell that a beauty product isn't working for my skin is when I start breaking out. My skin goes on defense mode by having acne breakouts and giving me extreme dry skin. I do wait out another week or two once this happens to see if my skin will adjust and go back to normal but once it stays as it is, I stop using the product or products and go on "clean-and-hydrate mode". Lately I have been using the Zapzyt Acne Treatment Gel | the original Zit Zapper to spot treat the red, painful pimples I get. This works fast and eliminates the redness right away and reduces the appearance of acne within 5 hours. I use this at night after I have cleansed my face. 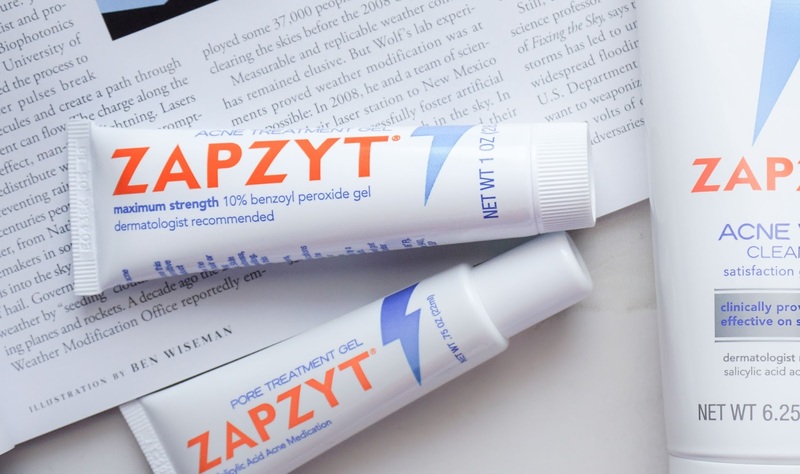 The Zapzyt Acne Treatment Gel has 10% Benzoyl Peroxide and is water based which prevents from overly drying my skin. 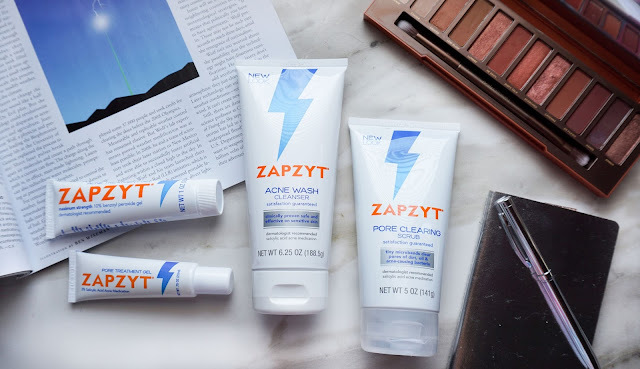 Another pimple zapper is their Zapzyt Pore Treatment Gel which has 2% Salicylic Acid, which will cut through greasy skin and penetrates pores putting the treatment in the heart of the pimple. This is oil-free as well that has Aloe and Brazilian Botanicals to reduce redness and moisturizes skin to prevent dryness. 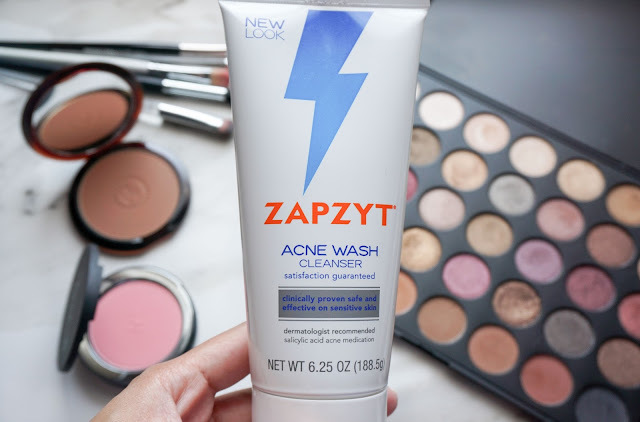 Besides using the acne zapper, I also use the Zapzyt Acne Wash cleanser afterward with either my Clinique Sonic brush or just my hands. The Zapzyt Acne Wash balances powerful salicylic acid with soothing aloe and chamomile. I like that this is an oil-free and alcohol-free cleanser as well which is really great for my sensitive skin! I have been sharing this with the hubby and he likes it as well.This is also great to use on back and chest acne. Once or twice a week, I use a pore clearing scrub. 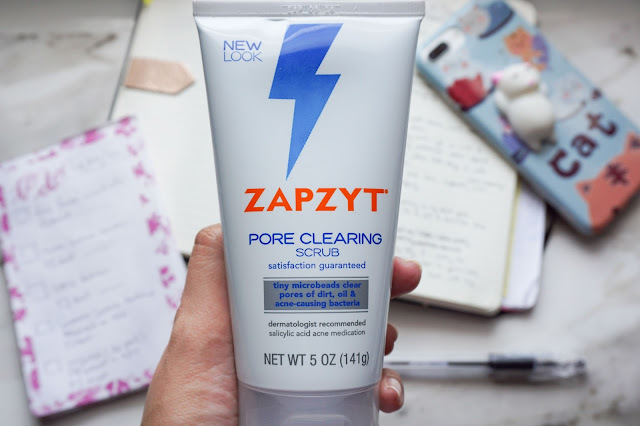 The Zapzyt Pore Clearing Scrub has powerful 2% Salicylic Acid. This is a gentle exfoliating cleanser that clears pores of dirt, oil and acne causing bacteria. This is actually the most gentle scrub that I have tried. *warning: Use of other topical acne medication at the same time or right after use of this product may increase dryness or irritation. If this occurs, only one medication should be used unless directed by a doctor. ALWAYS check with your doctor before mixing any "medicated skincare products" to avoid extreme skin irritation. What's your acne remedy of choice?